As soon as the cooks heard Gurumayi’s voice, they turned their beaming faces to her and chorused with great enthusiasm, “Welcome! Happy Birthday, Gurumayi!” Gurumayi smiled and waved, and walked toward one of the cooks, who was stirring a large pan of warm, fragrant, saffron basmati rice. In Indian cooking, saffron—kesar in Hindi—is accorded a special place. For many people in India, saffron is synonymous with celebration. When you see these delicate ruby-orange threads garnishing a dessert—kheer, for example, or shrikhand—or else imparting a deep golden hue to rice and other savory dishes, you know the occasion is significant. And because of its many beneficial and appealing qualities—and its color—saffron is often stirred into the sandalwood paste that is used for puja and yajna rituals in India. There is a reason why this golden spice is used with such care, why it is considered so precious, and why it is often quite expensive. It comes from the stigmas of the saffron crocus, a vivid purple flower that is found in India, as well as in Iran, Morocco, and Greece. The saffron crocus blooms just one week out of the year, and each flower grows only three stigmas. Saffron has to be picked by hand specifically in the morning, when the stigmas are still shielded by the as-yet unopened petals, and then those stigmas must be dried. To produce just one ounce of saffron requires harvesting about 3,000 stigmas. Saffron is a warming spice; its flavor is subtly sweet, its aroma intoxicating, and its health benefits manifold, providing us with over 150 essential antioxidants, minerals, and vitamins. Chefs around the world use the spice with an awareness of, and respect for, its value. Gurumayi greeted me, took the huge cooking utensils in both hands, and began stirring and fluffing up the rice with great energy. As Gurumayi stirred the rice, I felt that Gurumayi was bestowing blessings on the food, on all who would eat it, and on the entire world. In Indian culture, food is a central part of every celebration. It is believed that by cooking food and serving it to people, we earn punya-karma, merits; for punya is earned, and can only be earned, by doing deeds that are beneficial for others. People would save up their money over many months, and even years. Then, when it was time for a celebration in Gurudev Siddha Peeth, they would give this money as a donation for the bhandara, the special feasts held on that day. Those of us who visited and offered seva in Gurudev Siddha Peeth in the 1980s also recall how people would arrive from all parts of India and—within minutes of walking through the lotus gates at the entrance to the Ashram—they would find their way to Annapurna Kitchen. In no time at all they would be chopping, stirring, rolling out chapati. If it was already mealtime when they arrived, they would start serving the food. People would sit in rows on the floor, as is traditional in India; the devotees serving the food would then walk through these aisles, big steel containers of rice, daal, sabzi in hand, and, with a smile on their faces, ladle out food to each person. There would always be such love and care, such gratitude and humility in the cooking and serving of food. And joy—everyone in Annapurna, both the servers and diners, were united in their enjoyment. Not only would the temperature outside be hot and the dishes steaming; everyone would be experiencing warmth emanating from their hearts as well. There was satisfaction galore! Some of you reading may also remember Chumchum. This was akin to the Amrit Café; it would be set up by devotees arriving from different parts of India to participate in the celebrations. Annapurna Dining Hall had a schedule for serving three meals a day at specific times; Chumchum, on the other hand, was open 24/7. No matter what time a devotee arrived in the Ashram, they would be fed. There would always be people cooking and serving food in Chumchum with great enthusiasm. It was the same on Gurumayi’s and Baba’s tours throughout India. At every stop, every venue, and at all times of day, you would find people in the kitchen, preparing food so that all the sevites helping to put on satsang and Shaktipat Intensives would be nourished. When food is prepared and served in such a way, it is the harbinger of good merit, it is that which sustains life—this cannot be overstated. With this knowledge of the significance of cooking and serving food, let’s now return in our narrative to the Annapurna Kitchen in Shree Muktananda Ashram on Gurumayi’s Birthday 2018. Gurumayi moved from stirring the rice to the stoves where the sous-chef, Ramakant Adasme, was watching oil heat in a wok. Ramakant is a Siddha Yogi from Argentina who has been offering seva in Annapurna Kitchen for nearly twenty years. Ramakant had been waiting for quite some time for the oil to reach the perfect temperature to fry papadams, a crispy, savory wafer that is a staple in traditional Indian meals. Ramakant watched as the papadam sizzled and crackled in the hot oil, tripling in size almost immediately. “Oooh, yes! The oil is ready!” Ramakant said, with his charming accent and characteristic exuberance. Having received Ramakant’s permission, Gurumayi then added more papadams into the wok. Once the papadams had turned golden in color, Ramakant removed them from the wok. Gurumayi invited Ramakant to close his eyes and open his mouth. She then placed a piece of warm, crisp, golden papadam in his mouth. As I closed my eyes, I felt this upsurge of love, like a whirlwind of shakti. Afterward, I saved the rest of this papadam and, when we were done cooking, I cut it up to share with all the other cooks as prasad from Shri Gurumayi. Gurumayi continued to visit each cooking area in the kitchen and speak with the cooks about their dishes: set dosa, vegetable bhajiya, chilled mint green tea, sheets upon sheets of birthday cake, and so on. A photographer who was nearby asked for all the cooks to stand on either side of Gurumayi to capture the joy that was evident on everyone’s faces. Waving her hand, Gurumayi then turned to exit Annapurna Kitchen. With one elated voice, the cooks called out, “Sadgurunath Maharaj ki Jay! Happy Birthday, Gurumayi!” It was so clear from their glistening eyes and sweet smiles—the cooks had just experienced satsang with Gurumayi. They’d had their own special Birthday Celebration. And as the cooks returned to cooking the birthday meal, Gurumayi made her way to Shri Nilaya. This description of Gurumayi’s visit to the kitchen brought a smile to my face. It conveys the positive energy of the Ashram kitchen and conjures up the abundance and beauty of the food so vividly that, as I read about it, I could almost taste it. Most of all, I love the image of Gurumayi stirring the saffron rice, and interacting lovingly and mischievously with the kitchen sevites. Through this account, I feel that I too have shared the prasad of Ramakant’s papadam and savored the rice stirred by Gurumayi. My thanks to Shri Gurumayi for sending her birthday blessings rippling around the world in this way. I love this part of the birthday accounts. I felt like I was participating in a behind-the-scenes movie of what happens in the kitchens in order to prepare a grand birthday celebration. And I could feel how Gurumayi was giving so much love by participating in the cooking of the birthday meal. Thank you, Gurumayi, for reminding me to cook with love and with the awareness that food is God. I loved reading about the preparation of the food for Gurumayi's birthday and the love and enthusiasm of the sevites. I began cooking at an early age, and my family's encouragement and appreciation ensured I loved it then—and now. The account reminds me that when I first visited Gurudev Siddha Peeth as an eighteen-year-old, I was drawn to the kitchens. Like the sevites preparing food for Gurumayi’s birthday, I learned over time and with practice to cook with love. I have found that the intention with which I cook and offer food adds a subtle layer of flavoring and delight that cannot be matched. 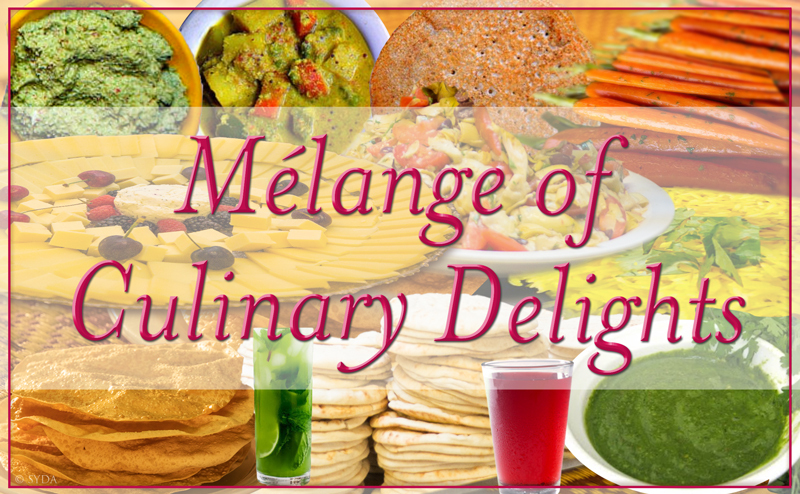 I realize now that my joy-filled experiences of cooking have been sweet moments of satsang. Thank you, Gurumayi, for this sweet understanding and insight.